- Beautiful old 1893 residence of the Charente region, renovated in July 2011, equipped with all modern conveniences, high standard amenities, in a small private walled landscaped park with heated pool and Jacuzzi. - Located in the historice village market town, 600 m away from the sea, 1 km away from the beach, quiet and rest guaranteed.
. See also: 4 existing rentals, listing reference 623171 (for 12), 623893 (for 10), 649039 (for 8), 649038 (for 18) on our website. - 2 shower rooms (shower, wash basin and toilet) at garden level in each of the 2 bedrooms. - 1 shared bathroom (bathtub, shower, wash basin, toilets and bidet) on the 1st level between 2 bedrooms. - 2 shower rooms (shower, wash basin, and toilet) on the 2nd level in each of the 2 bedrooms. - 1 shower room (shower, wash basin, and toilet) in the closed outdoor cabin next to the pool. - 1 shared toilet (with hand basin) on the ground floor. - 1 outdoor heated swimming pool of 8x4 m, access by a gentle slope, maximum depth of 1.50 m, counter current swimming, South facing, secured by a tarpaulin with bars, safe for kids and if the ball gets away. - 1 outdoor spa for 6 people, various mood lights, South facing. - 2 sets of garden furniture with 2 sun umbrellas, 1 barbecue, 6 sun loungers. We had a great holiday at this villa. Carine was there to meet us and we settled in very quickly. We had a bit of a problem when the weather produced a dreadful storm which ruined the pool but Carine sorted the problems out very quickly and we were back on target with a few hours. A great base to see the area with plenty of space for young and not so young. The spa was wonderful and the facilities were good. I was worried about the pool and the small children we had with us but a lot of vigilance and sensible use of the doors worked wonders. Keeping the cover in place was a big help and kept the pool warm too. Many thanks for your comments to encourage foreign people to stay into this wonderful villa. Be sure that everything is done for great Holiday to make memories. Swimming pool will be couvered in April 2017 in order to enjoy it all year at anytime. We were greeted by Carine on arrival and made to feel very welcome immediately. Carine went though everything we needed to know before she left us to it. We were away for a long weekend for our Friends special birthday and we couldn't have asked for anywhere better to spend it. There were 12 adults in our party and the villa was perfect with adequate space for everyone. 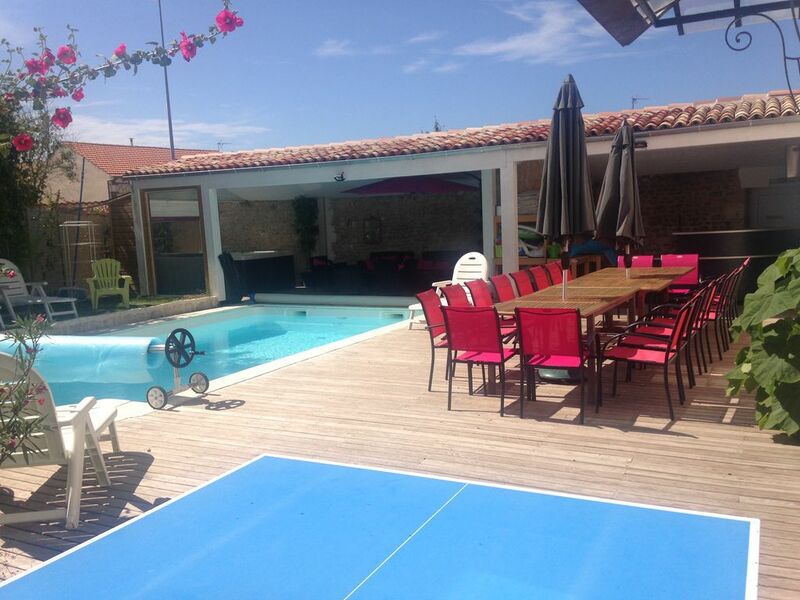 I would highly recommend this villa for large numbers of people, the standard of accommodation was excellent. The area is quiet but the train takes you in to La Rochelle and takes approximately 10 minutes. La Rochelle has a lovely Harbour with a large number of great bars and restaurants to choose from. The only thing to be careful of is that no shops open on a Sunday so make sure you get everything you need beforehand. Highly recommended. It's a wonderfull villa for birthdays or weddings, etc & everything has been thought for you to have fun with family or friends : come back & enjoy ! Many thanks for your comments. The property was large and well organised to keep all of our family entertained for the week we stayed. The pool, hot tub, piNg pong table and pool table kept all the six children, aged from 9 to 17 happy. We really enjoyed walking daily to the quiet local area which had everything we needed. We did all the large shopping at nearby Carrefour. We cycled to La Rochelle with local bicycles and went around La Rochelle on segways. We could have stayed another week and still had things that we wanted to do left. Carine was very friendly and helpful! Thank you! You're right, you should stay more or come back to have more fun ! Many thanks for confidence. We always look for your wellness & pleasure. Our combined stay with another family was truly and great experience. The villa was clean, well maintained, and had a fantastic French feel. Thanks to Carine for giving us such a warm welcome and helping with tips on area hotspots. The town of Angoulins was wonderful and was an ideal location for everything we wanted to do. With 5 kids between the ages of 9-15, the pool, Ping-Pong, pool table, darts, hot tub, was enough to keep them occupied for the week. I would strongly recommend this villa to anyone travelling in the area. Great ! We are so happy that Canadians & Swedes appreciate this beautiful villa & area. Many thanks for your kindness, it's fantastic to see how well you feel having a rest at the swimming-pool, spa and so on all together. That's French Holiday ! We were pleasantly surprised when we arrived at this holiday home, it is a stunning house in a good location. We were greeted by Carine, the owner, and she made sure we had everything we needed for our stay - she can be contacted by mobile if needed during the week. There were 13 of us staying in the house - a baby of 5 months, 4 young children, parents and grandparents. The house was ideal for us - there were sufficient bedrooms, there is also a futon bed in the living room if needed, but we had plenty of beds in the bedrooms. A travel cot and highchair are provided, there are stair gates on all 3 floors and the swimming pool and jacuzzi can be secured by a cover. Most bedrooms had ensuite toilet & shower, the two bedrooms on the 1st floor had a shared bathroom with bath & shower. 2 bedrooms are on ground floor, at the rear of the house (away from any noise) and further bedrooms are located on the 2nd floor, one of which has 2 sets of bunk beds and 1 double bed - ideal for groups of children. There is a baker, post office, small shop & cafe in the village, within easy walking distance. The sea and small beach is also close by, although for a good beach you need to travel a little further either by bike (lots of cycle paths around) or 5 minutes in the car to Aytre or Chatelaillon Plage (also the nearest town). We travelled to Ile De Re (20-30 mins) and Ile D'Oleron (1hr), both make good days out. Le Grand Village in Ile D'Oleron has a superb beach. There is a Carrefour hypermarket just outside the village, off the main road from La Rochelle, which is really handy. The property was clean and tidy, 2 x fridges, freezer, washing machine and tumble dryer. Swimming pool was a lovely temperature, Jacuzzi was a luxury. BBQ, sun loungers, outside table & chairs, pool table, table tennis ....everything you could possibly need for an enjoyable holiday! We had a fantastic week staying here and will definitely consider booking again. Merci beaucoup Carine et Yvan! We had our first family holiday with all 3 generations in Villa 1893, and it did not disappoint. We were welcomed by Carine and made to feel immediately at home. The Villa is equipped with everything a family would need and is spacious and clean. The outside area is great with a swimming pool and Jacuzzi. There are no safety gates around the pool, but there are stairs gates in the house, which was really handy for us as we had a toddler. Angoulins is a small village and is rather quiet, but this suited our style of holiday. There are two bars, but often with few if any customers. If more lively entertainment is wanted, it is easy to get to La Rochelle which is much larger. It is great for walking and cycling with designated cycle paths all over. The beech at Angoulins is not great for sunbathing, but there are lovely beeches near by at Chatelallion or a drive to Fouras, which was our favourite. There is also a large Carrefour located just outside Angoulins along with a selection of shops. There was also a soft play there which we took our daughter to on rainy days. Angoulins is ideally located to explore the surrounding towns / cities. La Rochelle is only a 10minute bus ride away and the bus stop is right outside the house. It only cost 1.30 euros for a single fare, which is much cheaper than the UK. It is only an hour to a fabulous Zoo near Royan. There are several islands to visit such as Ile d’axe and Ile d’Re. Ile d’axe was fabulous and would recommend getting the ferry from Fouras and hiring bikes on the island. Overall, we had a great holiday and would recommend Villa 1893, we would certainly consider holidaying again here. Manny thanks for your comments which are the reality except for the swimming pool. The safety of the swimming pool exists thanks to a cover with bars which recovers it and which you have to install. When you bathe and when you discover the swimming pool, it belongs to you to watch at your children. It is imperative to close it when you do not use it anymore and to fix the cover with bars with the appropriate belts. The children cannot then fall into the water. Come back again, it was a pleasure to welcome you ! Angoulins-sur-Mer is a small historic village on the seaside; it has the privilege of being located in a preserved natural area with a small unique natural port, 2 small unspoilt beaches, a peninsula with a listed archaeological cliff, oyster-farming area inside former salt marshes, cycle paths on the seaside with beautiful views over the sunset. With a microclimate, Angoulins-sur-Mer will be your starting point for the Ile de Ré, Ile d'Oleron, Aix, Madame and Fort Boyard, or towards other beaches and sites such as Chatelaillon, Fouras, Royan, the Cote Sauvage, La Palmyre.